Just a quick post to show you that I have started on a new project. The squares are small and progress is slow and steady. This is probably my favorite kind of piecing, and to some extent it is perseverance sewing. However, I don't get bored piecing endless four-patch units as I enjoy the color and fabric play and just know that the final result will be well worth the effort. Many more four-patch units still need to be pieced. And this one is looking just as gorgeous as its predecessors. Love the colourful look so far - can't wait to see the end result. 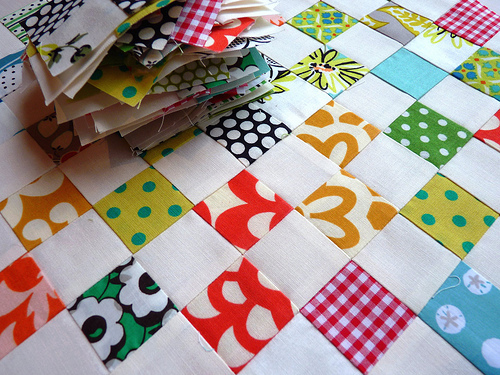 I love the look of small patchwork! This one looks great so far as usual. So pretty! You haunt me in a good way! I just love where you go! Looks just wonderful. The colours are so fresh. It's a beauty and I can't wait to see the final quilt. Rita - I love when you debut a new project! The colors are fabulous! Quick question for you on piecing accurately. I think you prewash your fabric...do you starch when you iron? While I think my 1/4" seam has gotten much better, it seems that my cutting isn't as consistent and I'm having a hard time getting those corners to line up. Advice?? Another beauty in the works! Beautiful! I guess it begs the question...how small are they? What defines a "four patch unit"? I tried to figure it out from looking at your quilt but I can't tell. This looks wonderful, as all your quilts do! 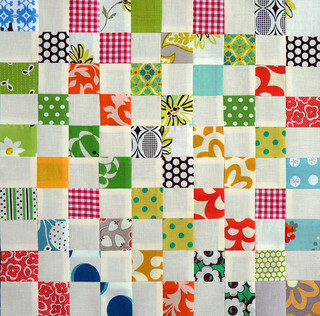 I have to try one of these quilts with mini-squares! How small are your squares? 2&1/2"? Do you actually cut each square individually or hurry the process up by sewing 2 strips together and then cutting into 2 &1/2" sewn pairs of squares? you are an unstoppable force of nature! I love the way you mostly used full white, but then sometimes switched and used a white fabric with a little bit of a print showing on it. That's a LOT of little bitty pieces, Rita! Once again, I'm in awe of your skill and your patience! That is beautiful, so vibrant, I love it! Just curious, why four squares rather than long strips of squares? Looks lovely and so colourful and cheerful looking. My wonderful quilt arrived yesterday - I did send you an email. Thank you so very much it is gorgeous and I love it. Oh my..............How beautiful is your work, your use of colors. Your quilts!!! Such fabulous inspiration. Great photos! Thanks for such a beautiful blog! It all looks so very very perfect! Either you have great perseverance, or you are just perseverating (ha ha). Either way, it is going to be a gorgeous and happy quilt. This is really bright and lively Rita. I really like it!